I love chocolate dipped strawberries like everyone else, but I don't particularly like making them.... tempering the chocolate just right, waiting for the chocolate to harden, etc. 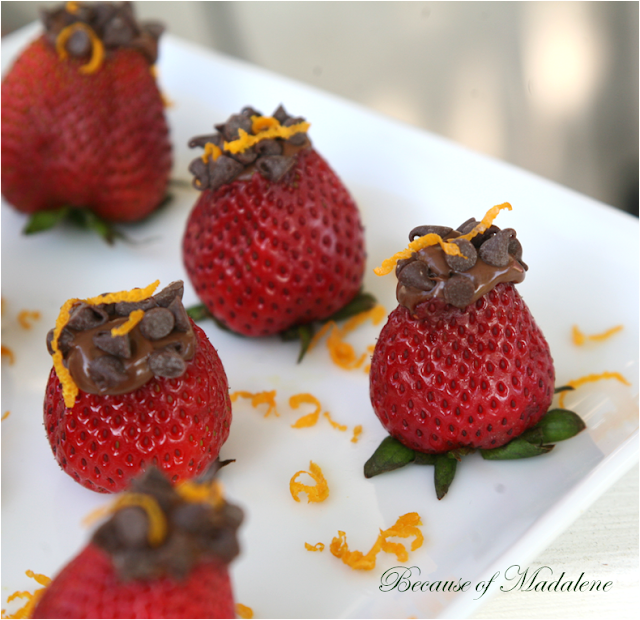 But these Nutella Stuffed Strawberries are fast to make and you can enjoy them immediately! Nutella not only adds a decadent chocolatey punch to the sweet strawberries but gives them an extra kick of nuttiness from its infamous hazelnut flavoring. And to give this small dessert some crunch, a few mini chocolate chips are placed on top. Now, you know me and citrus... we're best buds. So to finish this yummy bite off... some orange zest sprinkled on top for a pop of freshness. I made three batches of these and could have had three more. Yum! With a skinny knife, cut out the center of the strawberries. But don't throw that part out... that's good meat from the strawberries. I ate them as I went. :) With a pastry bag (fitted with a small tip) filled with nutella, pipe the chocolate into the hollowed strawberry. Place on the mini chocolate chips and sprinkle with orange zest. A yummy experience, all in just one bite!